A Very Scary Fireworks Show: Exploding H-Bombs In Space : Krulwich Wonders... Back in 1962, the U.S. blew up a hydrogen bomb, creating what might be the greatest fireworks spectacular ever. People in Hawaii gathered on rooftops, sipping drinks, as they watched a radioactive rainbow display in the night sky. Some of the images in this video were until recently top secret. Peter Kuran of Visual Concept Entertainment collected them for his documentary Nukes In Space. If you are wondering why anybody would deliberately detonate an H-bomb in space, the answer comes from a conversation we had with science historian James Fleming of Colby College. To understand where the colors come from in Starfish Prime, you first have to know a little bit about Earth's atmosphere. Nitrogen and oxygen are the two most abundant gases in our air. The concentration of each gas is different depending on the altitude. When Starfish Prime detonated, charged particles — electrons — were released from the explosion. According to NASA astrophysicist David Sibeck, those particles came streaming down through the Earth's atmosphere, energizing oxygen and nitrogen atoms, causing them to glow in different colors. As electrons collide with the atoms, energy is transferred to the atoms. After holding onto it for a moment, the excess energy is released as light. When many excited atoms release energy together, the light is visible to the naked eye. Depending on the type of atom and the number of atoms, you get different colors. It's similar to what causes the aurora borealis, although those electrons are coming from the solar wind pounding into Earth. 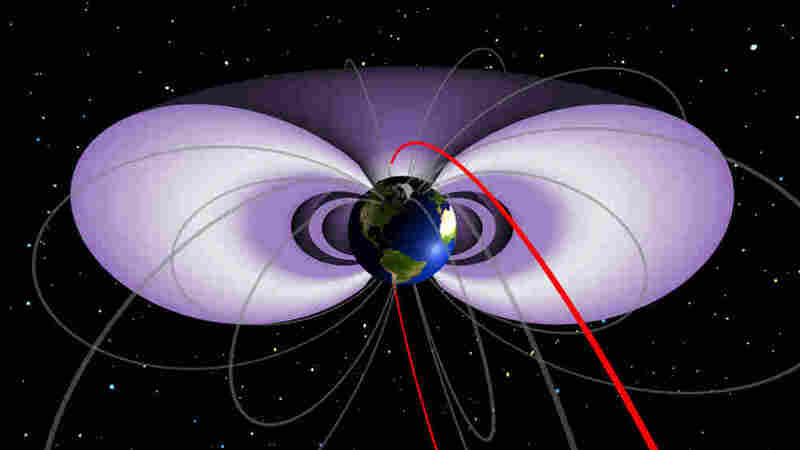 The electrons first encounter a high concentration of oxygen at the upper reaches of Earth's atmosphere, causing the atoms to release a red light. Then green appears as the electrons travel to lower altitudes where there are fewer oxygen atoms. Even lower, where more nitrogen atoms are present, the collisions throw off a blue light. The scientific basis for these proposals is not clear. Fleming is trying to figure out if Van Allen had any theoretical reason to suppose the military could use the Van Allen belts to attack a hostile nation. He supposes that at the height of the Cold War, the most pressing argument for a military experiment was, "if we don't do it, the Russians will." And, indeed, the Russians did test atomic bombs and hydrogen bombs in space. To hear eyewitness accounts of what it looked like, listen to our broadcast on All Things Considered by clicking the Listen button on the top of this page. In the audio and video versions of this story, it was incorrectly stated that the Starfish Prime bomb was 1,000 times bigger than the atomic bomb dropped on Hiroshima in 1945. Starfish Prime was 100 times bigger than the Hiroshima bomb.